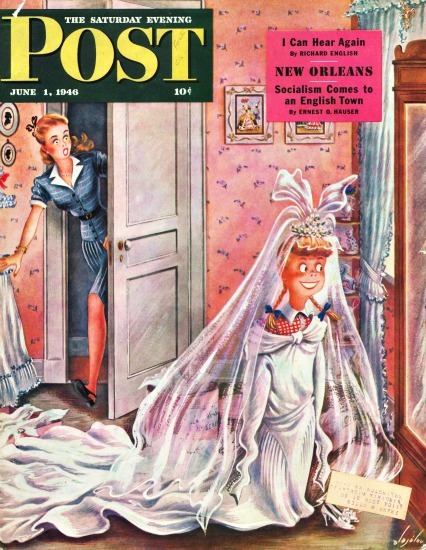 As spring begins, the window opens for the chance to be a June bride, that most coveted month for nuptials. This June the window may open wider. Bringing a breeze of fresh air into the traditional notion of marriage, June is when we can expect the U.S. Supreme Court to make their ruling concerning marriage equality. 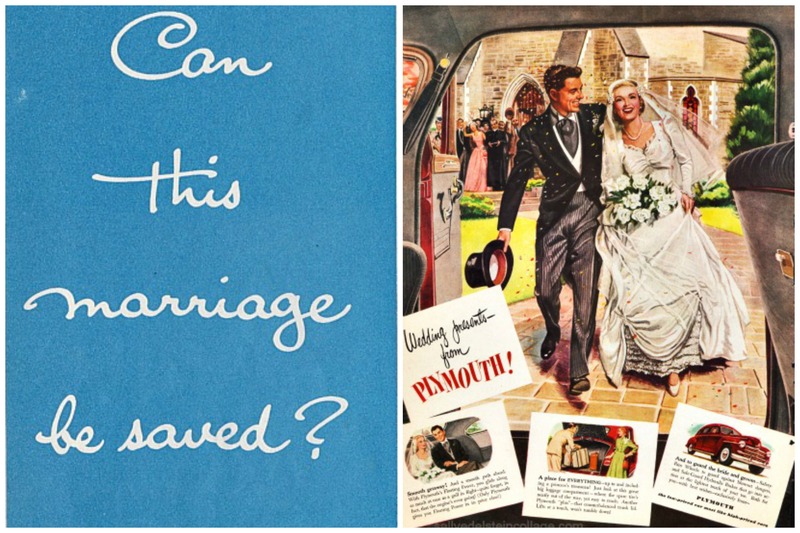 Notions of traditional marriage are dated as some of these images we have all grown up with. Like the appearance of the first crocuses, each spring would bring with it a new crop of bridal and wedding themed imagery. 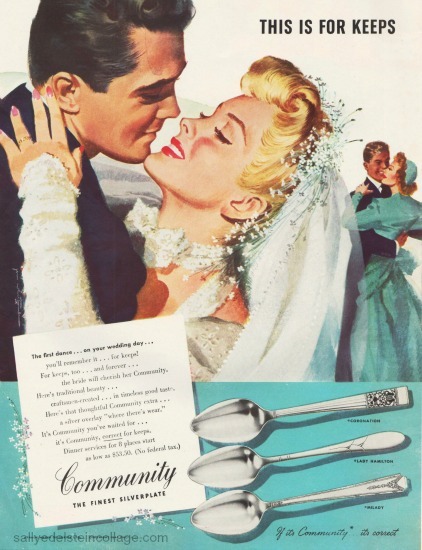 Every magazine you flipped through, every ad you saw, painted the same glowing picture of the inevitability of marriage. 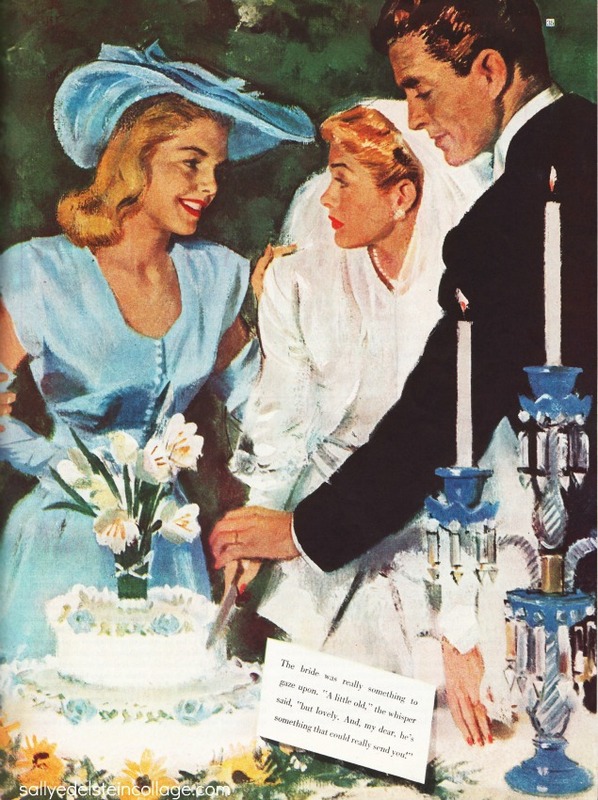 For most of the past century girls on the fast tract to matrimony were convinced that the basic occupation of every girl was choosing a man to marry. 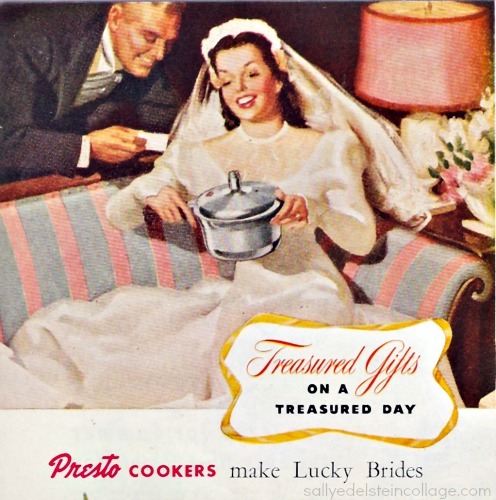 And what gal didn’t close her eyes and imagine her wedding shower, filled with all that latest Wear-ever pressure cookers, copper bottom Revere Ware and her very own silverplate? This would be for keeps. 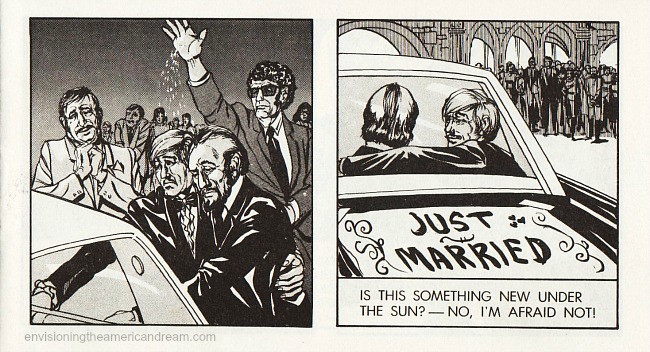 You’ve dreamed…forever…of this moment! You’ve lived…forever..for this minute. You start forever with this minute. This is for keeps. 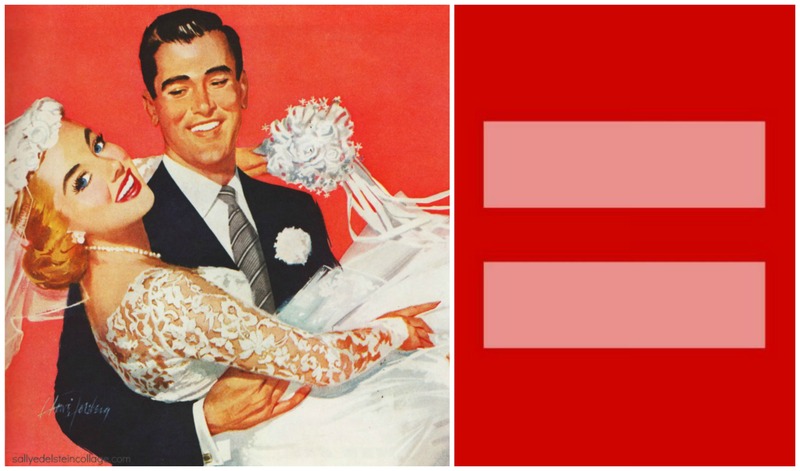 And marriage equality should be for keeps. 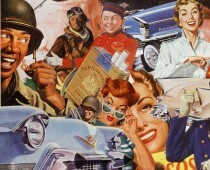 The Supreme Court heard 2 landmark marriage equality cases last week bringing us one step closer to defeating discrimination, ensuring all Americans are treated equally under the law, and finally removing some of the barriers to Gays and Lesbians full participation in the American Dream including marriage. 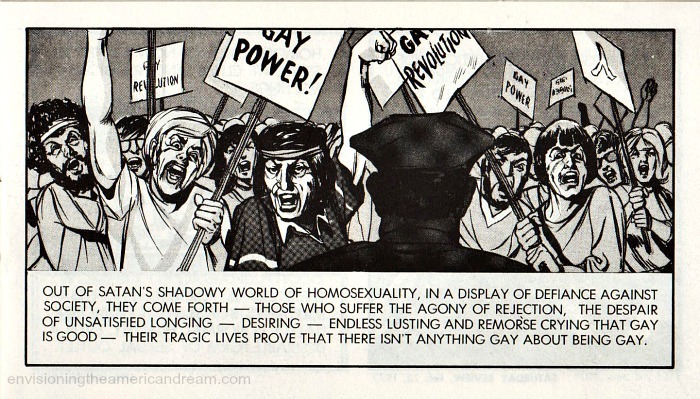 It wasn’t long ago that this notion was inconceivable if not down right frightening as portrayed in a 1972 homophobic comic booklet entitled “Gay Blade”, which ominously predicted a future filled with..gasp….gay marriage. 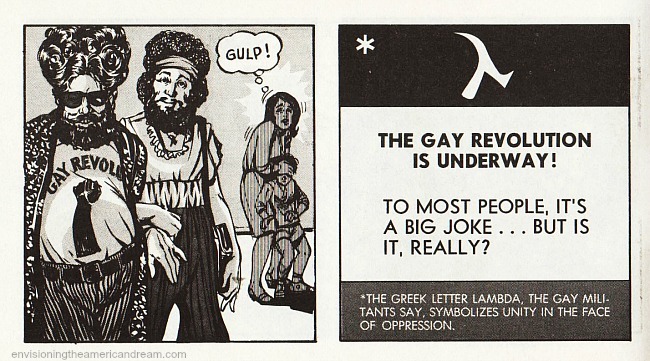 “The Gay Blade” ( originally written in 1972, revised in 1984 and now out of print) borrowed several of its frames from a 1971 Life Magazine photo essay on the Gay Liberation movement, but with the images altered to make gay men look more depraved and stereotypically feminized. 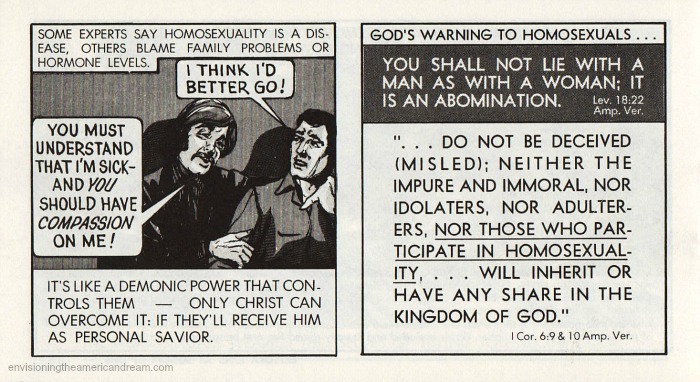 Chick tracts are unequivocal and explicit in their opposition to homosexuality and repeatedly employ themes such as 1.The belief that God hates homosexuality and considers it to be sinful and 2. 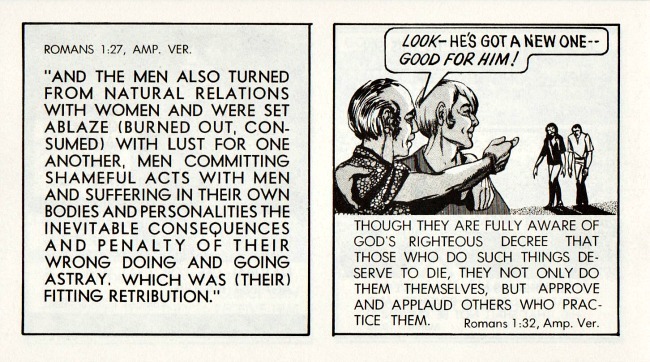 The true nature of homosexuality is revealed in the Christian fundamental interpretation of the biblical Sodom and Gomorrah story. 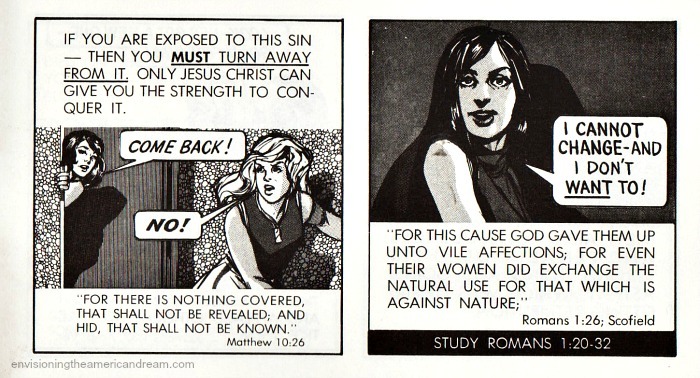 Since 1961 Chick has cranked out tract after tract to” help sinners see the light, believing that Jesus can deliver anyone from Homosexuality and make them a new person. 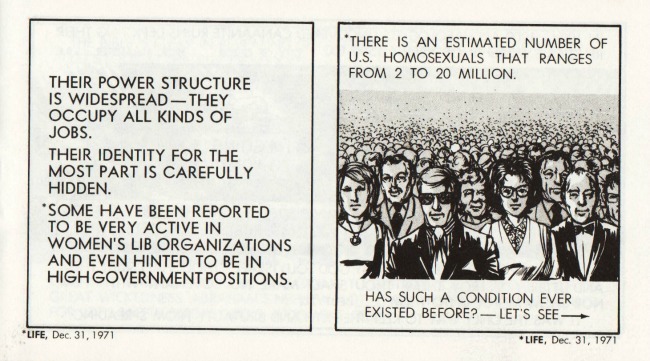 The fear mongering continues over 40 years later. 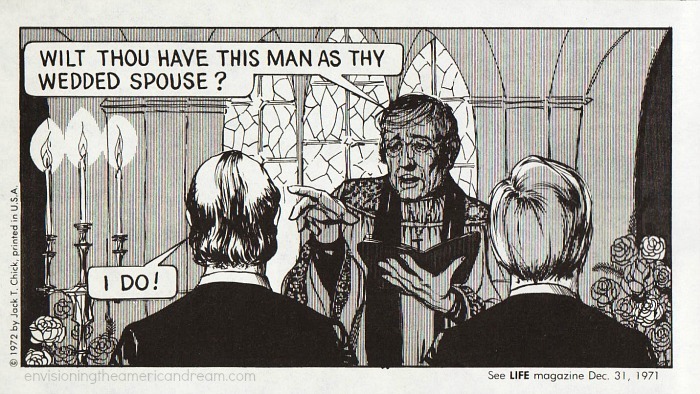 Conservatives are desperate to hold onto the traditional definition of marriage. 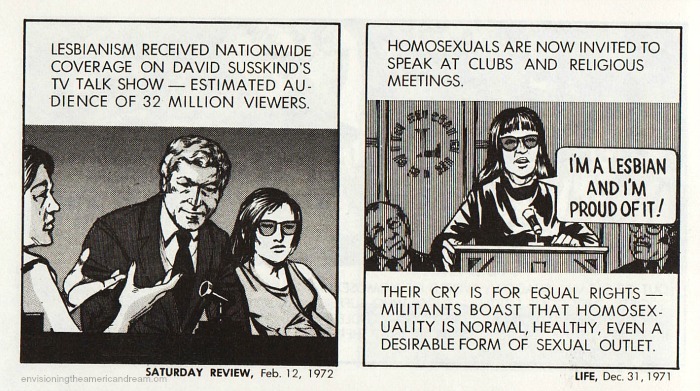 Just last week Think Progress reported that some Fox News contributors have recently claimed that Marriage Equality would actually criminalize Christianity. “Two Fox contributors made dire predictions along those lines. Todd Starnes speaking on American Family Radio, argued that “persecution (of Christians) like we have never seen it” had “already started” as a consequence of the marriage equality movement.